If the recently redesigned, light-duty Ram 1500 or even three-quarter-ton Ram 2500 can’t meet your demands for towing and hauling, the one-ton, heavy-duty 3500 will get the job done with almost equal refinement. This truck comes with various configuration options and with three engine options including the legendary Cummins turbo diesel which delivers monumental torque. The Ram 3500HD is also comfortable and well equipped and provides class-top riding comfort. The 2019 Ram 3500HD is the next version of this truck to come but this model won’t bring radical changes in the game. Ram redesigned the light-duty 1500 for the 2019 model year and was also caught while testing the new-generation, heavy-duty prototypes. However, it appears that prototypes are performing testing with some body parts from the current version. 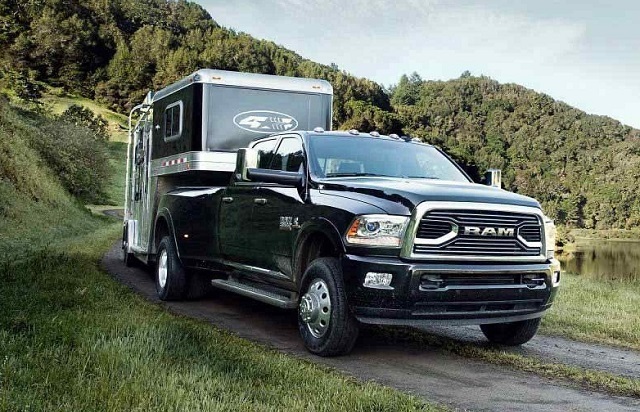 So, it seems that development isn’t far from the early stage and redesigned heavy-duty Ram will likely arrive as the 2020 model or even a year after. The arrival of the all-new Ram 1500 gives us an idea about the look of the new-generation HD Rams. We should expect new face without of the crosshair grille, resculpted body panels, lighter structure, etc. However, for that, we will have to wait the beginning of the next decade while the 2019 Ram 3500HD will return in the familiar form. The 2019 model year will likely be the last for the crosshair grille style and on the 2019 Ram HD, the finish of the grille will change with almost every trim. More chrome will appear on the grille and other exterior elements in upper grades while low spec versions will get less brightwork, smaller wheels, etc. The interior of the big-Ligue Ram will also return in the familiar form. The truck comes with comfortable seating and plenty of storage flexibility. The form of the interior can also change from the tough to premium comfort and luxury. The truck also has neat and easy-to-use controls and the Uconnect infotainment system is our favorite in the class. When it comes to the power options, Ram might ditch the 5.7-liter V-8 engine for the new generation versions, as some reports suggest. However, this engine will remain the base option for the 2019 Ram 3500HD. It can produce 383 hp and torque of 400 pound-feet. The engine will come in the pair with the six-speed automatic transmission. A more gas horsepower will deliver a 6.4-liter HEMI V-8 engine. This engine also works in the combination with the six-speed automatic. However, it is the payload champ with 7, 350 pounds thanks to 410 hp and torque of 429 lb-ft. When it comes to towing capabilities, the title takes the legendary 6.7-liter Cummins Turbo Diesel V-8. When combined with heavy-duty, Aisin six-speed automatic transmission, this engine makes 385 hp while torque reaches impressive 930 lb-ft. The Cummins powered models can tow up to 31, 210 pounds in some configurations. The 2019 Ram 3500HD will again be available from around $34,000. The market launch will be in late 2018.